Two of Hollywood's Newest Shining Stars Have Been Sent the Biggest Baby Swags Basket Filled With Must Have's for 2008. Jennifer Lopez Twin Diaper Cake We were so excited to be given the opportunity to be part of the gift basket. We made a beautiful twin diaper cake for Max and Emma. We sure hoped they enjoyed it!!!!! 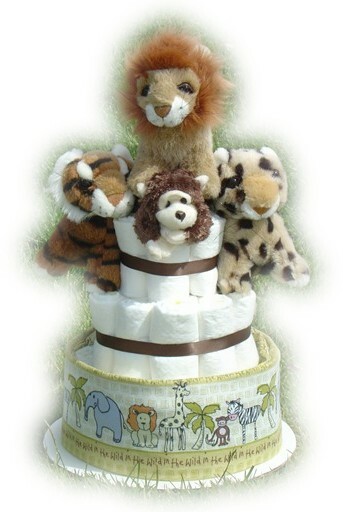 We were honored when NBC contacted us to make a special Safari Diaper Cake for co-host Regis Philbin of Live with Regis and Kelly, Regis' new grandson, William Xavier Schur. 2007 Sundance Film Festival - "King of California" Premiere and After Party As per Dana Wilkey's request of Adwil Agency, we were invited to participate in the promotional launch of KING OF CALIFORNIA starring Michael Douglas and Evan Rachel Wood and SLIPSTREAM starring Anthony Hopkins and Christian Slater. Each guest attending the dinners received one of our fabulous candles at their place setting. 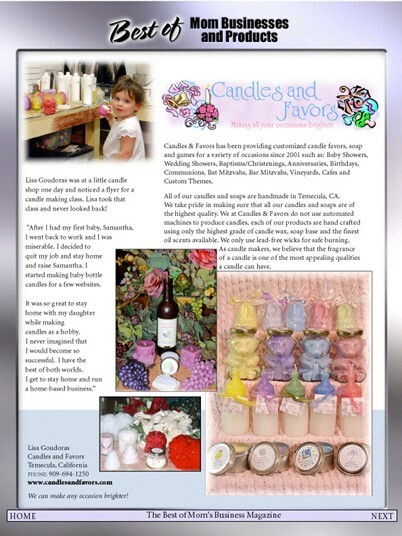 We were thrilled to be featured in the very 1st issue of MomsBusinessMagazine.com as "Media Maven Mom"!